I love these blocks! So cute with the rick rack! I am making my first attempt at writing directions. A friend of mine asked me to teach her to quilt. It is amazing how hard it is to write out things that we tend to do automatically! 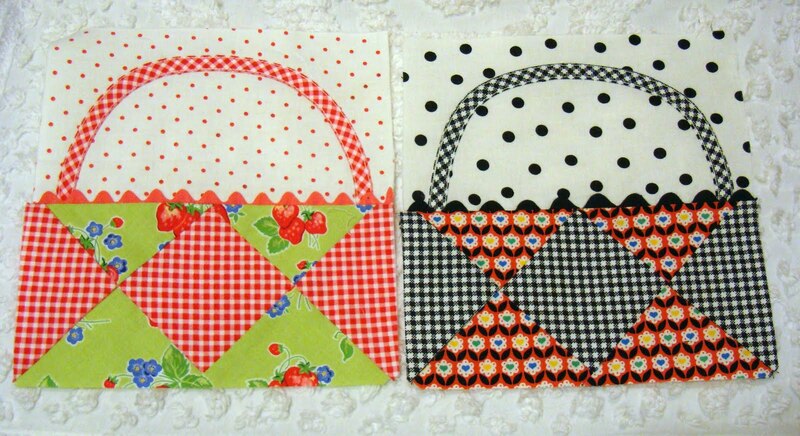 These little bag blocks are so cute! OH my gosh. That is so stinking cute!! OH my goodness - too stinking cute! 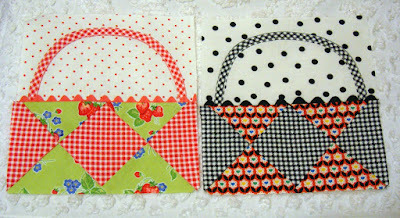 Love the rick rack trim and I will be eagerly awaiting the release of your pattern. Happy stithcing! Cute!!! Looking forward to the pattern. You are so right. I'm always amazed at how different fabrics change and alter the looks of a block. Love what you are doing. Looking forward to seeing the pattern. Being new to quilting I appreciate all the good walk though. I read each one even if I don't plan to make the item just to learn from those of you that are experienced. Ok....just sign me up :-)!! Those blocks are stinkin' cute!! Cute blocks. Writing pattern directions are difficult. I wrote one for a dresden quilt I designed so that I could teach a class. These blocks are too cute! You are so right about fabric choices. I used to turn away from some patterns because I didn't like the fabrics they used in the example but now I try to look at the pattern & if I love it, try to vision it with my fav fabrics. You are such a talented woman, Nanette. Can't wait to see the finished product. Love checking in to see what you are doing!